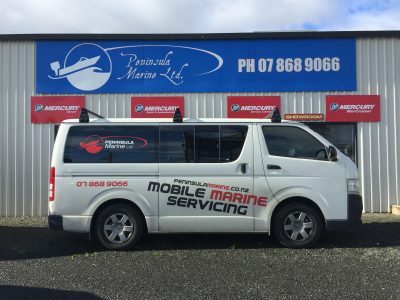 Services | Peninsula Marine Ltd.
Peninsula Marine Ltd is the longest established marine dealership on the Coromandel Peninsula established by Alan and Fiona Thomsen in 1986. Peninsula Marine‘s core business is marine retail sales and service, as well as a comprehensive range of chandlery, electronics, trailer and outboard spare parts, fishing tackle and accessories. Inboards specialists, Outboard specialists for Mercury and Evinrude plus all makes and models. Make a booking below. Mercury certified service centres have made a commitment to provide a professional level of service, focusing on a superior level of workshop service personnel and equipment. To become a Certified service centre it is also a key requirement to show commitment to providing a high level of customer satisfaction. As well as outboard we also service Mercruiser sterndrive, both petrol and diesel. 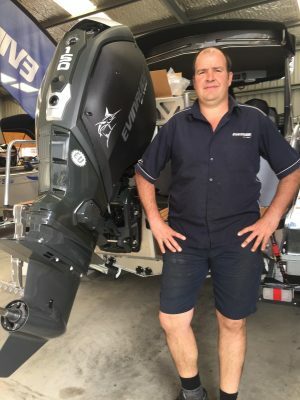 Peninsula Marine Ltd is also an Evinrude Etec certified workshop providing the same level of professional knowledge and equipment to service the latest in Evinrude E-TEC technology. Prop servicing has been a part of our business for years, we can rebush, balance, refurbish, repitch most props. The team at Peninsula Marine also have a workshop in the Whangamata Marina/dry dock. Servicing all makes of heavy Diesel/petrol inboards engines. We also have a mobile service van that travels all around the Coromandel Peninsula carrying out quality service to all marine engines. Contact us above to make a booking for the team to come to you. Alan Thomsen has worked in the marine industry for some 36 years, qualified as an automotive technician first and moving on to Johnson/Evinrude outboard technician. He now runs the retail and sales side of the business. David Lyon started with Peninsula Marine in 1992, worked to become a OMC Evinrude Master technician in 1997 through to 2002. He now is a qualified BRP Evinrude and certified Mercury outboard, Mercruiser technician. Shaun Thomsen is a fully qualified Automotive technician, as well as Evinrude and Mercury outboards, Mercruiser sterndrive experience. Shaun has thousands of hours experience as a professional game fishing deckhand and holds his skippers ticket. Shauns also services game reels and has a wealth of knowledge in fishing tackle, specializing in game tackle. 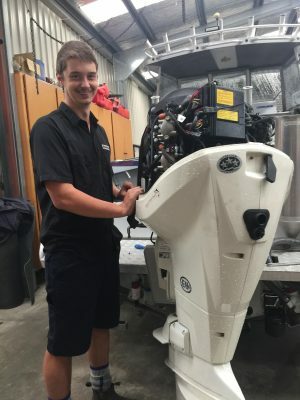 Lochie Freer is in his second year of his Marine Technician apprenticeship. 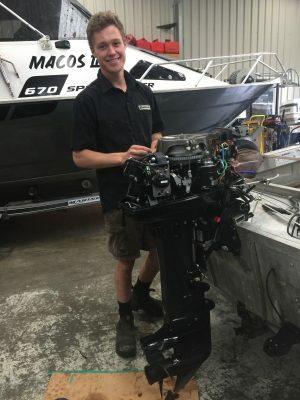 Lochie is starting to complete Mercury and BRP courses to upskill and qualify as a Mercury and BRP technician. Fiona Thomsen is in charge of the office and accountancy and keeps the wheels turning. Dylan Ayre is in his fourth year of his Marine Technician apprenticeship. Dylan has completed his BRP training and has qualified as a BRP technician. He is also working towards his Mercury Technician Certifiate.